Pact uses cash stakes to help you achieve your health goals, week after week. By this time every year, New Year’s resolutions start falling to the wayside. We get it. It’s cold outside. You’re busy. You’d much rather lounge and watch Netflix. If you find yourself in need of an extra push of motivation, cash incentives might be what you’re looking for. Make a commitment to how many days a week you want to exercise and how much you’d be willing to pay if you don’t hit your goal. If you don’t hit your goal at the end of the week, you pay up. If you accomplish your goal, you earn cash rewards, paid by the users that didn’t quite make it! 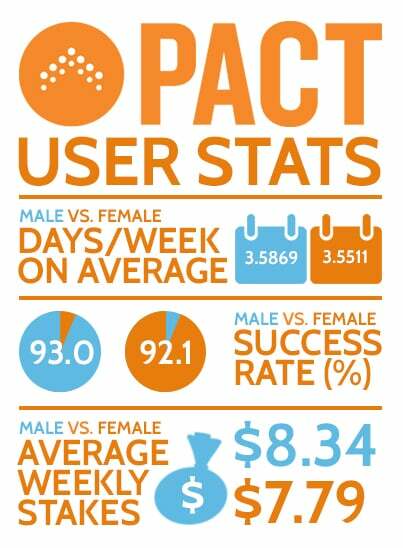 Since Pact launched in 2012, users have completed more than 5.2 million workouts and accomplished 92% of the goals they set. Numerous studies have been published on the success of cash incentives. But who is using them and how effective are they, really? Here’s some never-before-published data from Pact’s findings. Does more money on the line mean higher success? To a certain extent. The average success rate for users with a commitment of $5 or $10 per missed workout is 89%. Commitments of $15-$30 had a 95% rate of success at meeting goals, while users with $35 and above were 97% successful at hitting their weekly workout goals! Is the thought of paying other users $5 enough to get you off your booty for your morning run? Or is $20 the extra push you need? What time of year are individuals the most successful at achieving their exercise goals? Based on our 2013 data, we found that February was the month with the highest goal success rate. The week after Valentine’s Day had our highest success rate of the entire year! On the flip side, the holiday season was when users struggled the most to hit their fitness goals. The week with the lowest success rate was Dec. 24 to 30. Pact’s data shows that men commit to exercise more days and put more money on the line. These factors lead men to achieve their fitness goals more often than women. Which states have the most committed workouts? The average user commits to roughly 3.6 workouts per week. 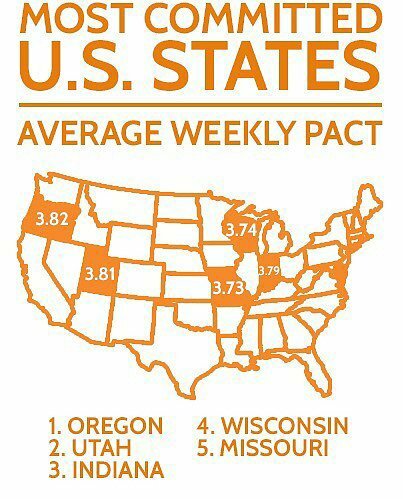 However, there are some standout states that are achieving more than the weekly average. Did your state make the cut? In a nutshell, cash incentives are a proven way to kick motivation up a notch. Data shows that higher stakes have a positive outcome on overall success. Our advice is to try a few different wager points until you find one that works best with your personal goals.